Pierre Jean Remy is a young man from Corail who has spent his professional life trying to help others. 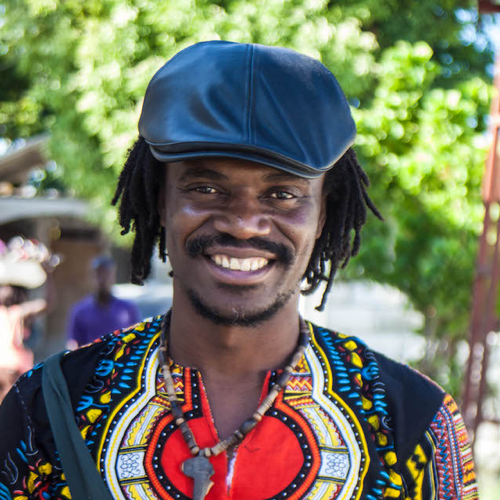 He used to be a school teacher, but he was paid so poorly and inconsistently that he began looking for other ways that he could make a living and make a difference in his community. Then he heard a sound truck going through his neighborhood announcing job applications for DloHaiti. Jean Remy applied and was accepted and began working the Ovive station in Corail about eight months ago. And he loves his new job. The fact that the job was advertised on a sound truck was an early indicator of the level of professionalism of his new employer: many jobs in Haiti are handed out to friends and family members, and DloHaiti was being public and transparent about their hiring process. Working for DloHaiti, Jean Remy is paid a good salary that is always on time, and he sees the change the water makes in his community. Jean Remy said that Corail was devastated by cholera, because people were drinking untreated water, and the arrival of Ovive was considered a godsend by his neighborhood. Now, people don’t get sick as much as they used to, and Jean Remy has seen that same change in himself. His hope is to keep working for DloHaiti for the rest of his career and to see more Ovive kiosks expand to more communities across Archaie. It would not only be sending clean water across the countryside, but decent, well-paying jobs, both of which are far too rare outside of the major metropolitan areas in Haiti.